Taipei, Taiwan (16 April 2019) – G.SKILL International Enterprise Co., Ltd., the world’s leading manufacturer of extreme performance memory and gaming peripherals, is announcing the rules and benchmarks for the G.SKILL 6th Annual OC World Cup 2019live contests. This live competition event will be held during Computex 2019 week, from May28th toMay31th, and consists of the Live Qualifier and Grand Final Stages. Between 23rd and the 10th of March 2 crew members of HWBOT (Dennis and Me) did a rally for charity, the Baltic Sea Circle Rally. We drove from Belgium to the North Cape and back, around the Baltic Sea without using highways or GPS in a 37 year old car, in the middle of the winter. Together with donations from HWBOT members we gathered 1185 euro for the Belgian Children Cancer Foundation, thank you guys! Now we are back, we can start working on HWBOT again! 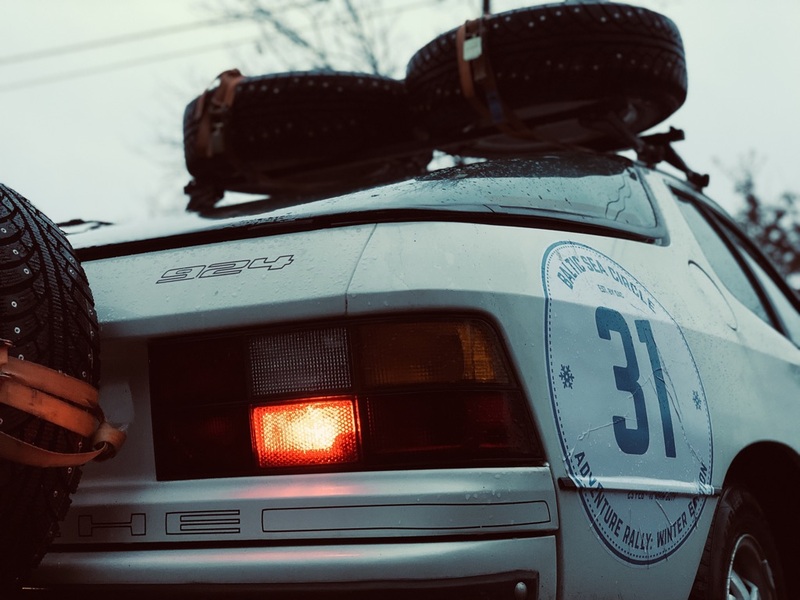 Between 23rd and the 10th of March 2 crew members of HWBOT (Dennis and Me) will be doing a rally for charity, the Baltic Sea Circle Rally. 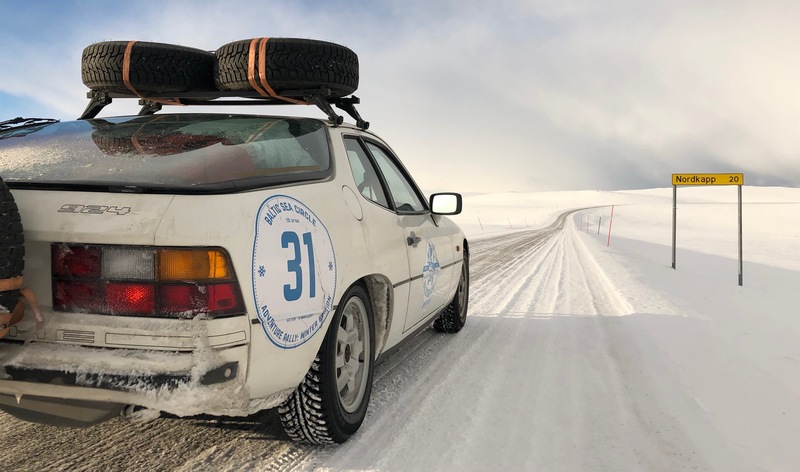 We are attempting to drive from Belgium to the North Cape and back, around the Baltic Sea without using highways or GPS in a 37 year old car, in the middle of the winter. If you ever contemplated donating to HWBOT, now is the time as all donations received between now and the 10th of March will be donated to in full to the Belgian Children Cancer Foundation. Thanks for all reporting issues through our github bug tracker, as it makes sure your issue is not lost in a mailbox or buried deep in the forums. We have 13 more open issues reported on our tracker, but the next 2 weeks there will be no active development on HWBOT. Dennis & me will be on an epic road trip to North Cape with an oldtimer, more about this in a next post. Wonder what we have been doing since HWBOT v8.0 went live last week? We started a public github issue tracker, and solved 5 issues in today's build. A community poll was created to gauge opinions in whether competitions should count towards your career points or not. Opinions vary, but 2/3rds are in favor one way of the other, so expect competitions points changes to career points soon. Our servers are much snappier and cause much lower load on the database. Joy! Found an issue and want to have it fixed, or at least be able to point out our lazy devs that the issue has been open for a very long time? Now is your time to shine! We have made a public repo on github so everyone with a github account can create and track issues. HWBOT Rev8 - should career also include competition points. The 8th revision of HWBOT has gone live, but the discussion whether competition points should be included or not in your career ranking remains unsettled. The seasonal league includes the points gained from the best 10 competitions entries. Should we do the same for career? HWBOT Rev8 going live now. The database migration will start in 20 minutes, and will take a few hours to complete. I will edit this message once complete. The 8th revision of HWBOT is currently doing a test run on UAT and will go live this Saturday. Thanks all from the crew and community for useful feedback during the development of this new revision! As revision 8 of the HWBOT rankings are being finalized, please take some time to leave feedback on how many of your submissions you want to have impact on your yearly seasonal ranking, and all time career ranking. Too many and grinding rankings will be needed, too few and there is no distinction between members having a lot of records and those with just a few. Taipei, Taiwan (8 March 2019) – G.SKILL International Enterprise Co., Ltd., the world’s leading manufacturer of extreme performance memory and gaming peripherals, is excited to announce the 6th Annual OC World Cup 2019. The online qualifier competition stage will be held from March 13, 2019 until April 16, 2019 on hwbot.org.The top 9 winners of the online qualifier will be qualified to join the live competition at the G.SKILL booth during Computex 2019 week from May 29th to 31st and compete for a chunk of the $25,000 USD cash prize pool. With the participation of top overclockers from around the world and carefully designed rules, G.SKILL OC World Cup is considered as one of the most challenging overclocking competition by professional overclockers. The G.SKILL OC World Cup consists of three rounds: Online Qualifier, Live Qualifier, and Grand Final. The top 9 winners of the Online Qualifier will receive eligibility to enter the Live Qualifier stage during Computex 2019 and demonstrate their finest LN2 extreme overclocking skills at the G.SKILL booth. The Online Qualifier round will be hosted on HWBOT.org from March 13 to April 16, 2019. For this stage, 4 particular benchmarks are selected to test each overclocker's memory overclock tweaking skills: Highest DDR4 Frequency, SuperPi 32m, Geekbench 3 Memory Performance single core, and 3DMark11 on integrated graphics processors. 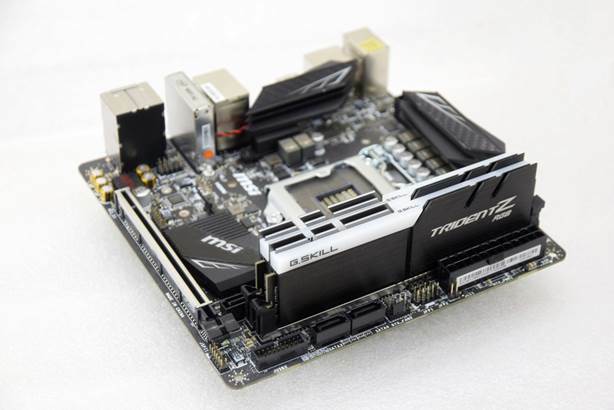 Participants must use G.SKILL DDR4 memory kits and the specified Intel platforms. 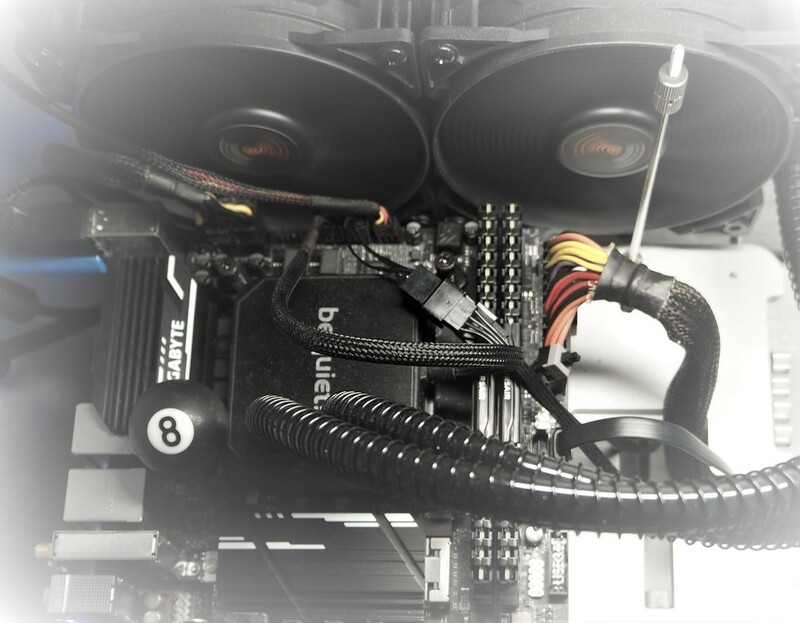 To give back to the extreme overclocking community, G.SKILL will be raising the total cash prize pool to $25,000 USD for OC World Cup 2019. The champion will receive a whopping grand prize of $10K USD – the largest single cash prize sum in the overclocking community. 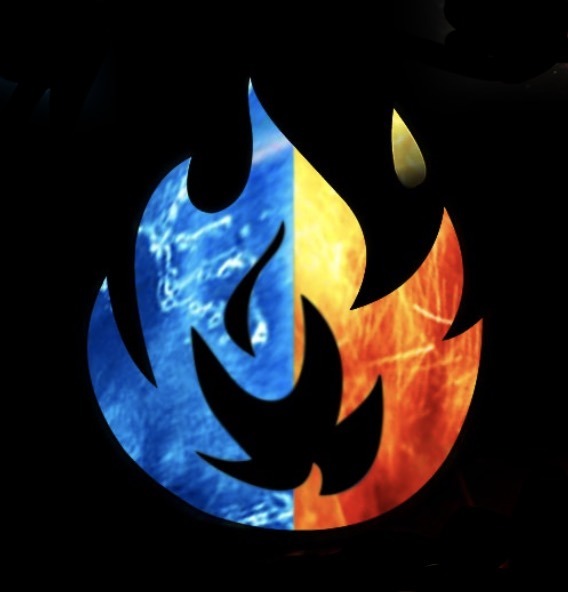 Additionally, for the first time in the history of OC World Cup, the total number of contestants for the Live Qualifier stage will also be increased from 6 to 9 participants to provide more opportunities for the overclocking community. Taipei, Taiwan (19 April 2018) – G.SKILL International Enterprise Co., Ltd., the world’s leading manufacturer of extreme performance memory and gaming peripherals, is excited to announce the release of new Trident Z RGB and Sniper X series specifications launching in conjunction with the release of the AMD Ryzen™ 2000 series processors and the X470 platform. 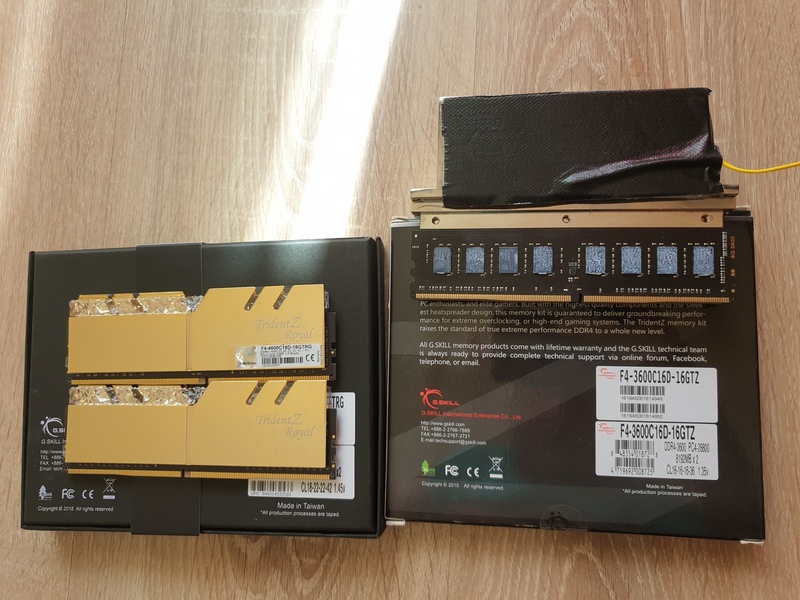 Kit specifications starting from DDR4-3200MHz CL16-18-18-38 16GB (2x8GB) to DDR4-3600MHz 18-22-22-42 16GB (2x8GB), these new specifications push the boundaries of AMD system performance to the next level. Armed with the latest IMC on the new 2nd generation AMD Ryzen™ processors, G.SKILL aims to bring users ultra-fast high performance memory kits to help increase overall system performance with the new X470 systems. 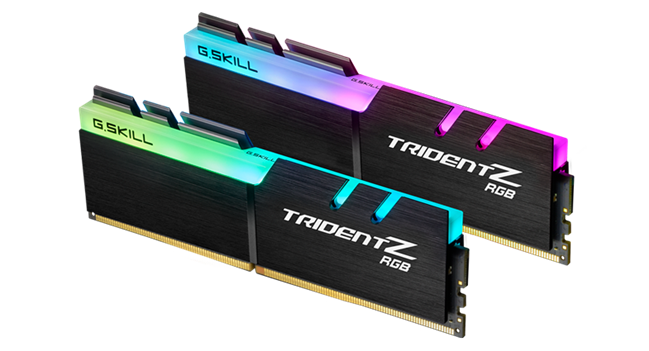 Trident Z RGB, with model numbers ending with TZRX, and Sniper X memory series now introduce several new AMD X470-specific memory specifications. Please see below for a complete list of the new specifications. Tested on the latest ASUS ROG CROSSHAIR VII Hero motherboard with the AMD Ryzen™ 2700 processor, the screenshot below shows Trident Z RGB for AMD running at DDR4-3600MHz C18-22-22-42 16GB (2x8GB). These new specifications will be available via G.SKILL worldwide distribution partners in late April 2018. Established in 1989 by PC hardware enthusiasts, G.SKILL specializes in high performance memory, SSD products, and gaming peripherals designed for PC gamers and enthusiasts around the world. Combining technical innovation and rock solid quality through our in-house testing lab and talented R&D team, G.SKILL continues to create record-breaking memory for each generation of hardware and hold the no. 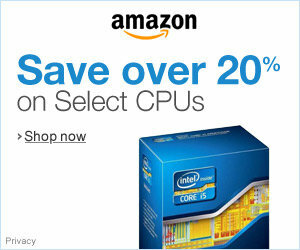 1 brand title in overclocking memory. 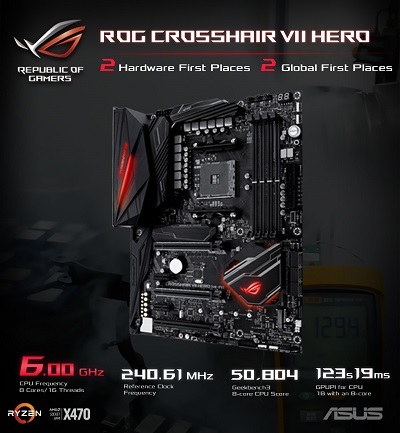 We’ve been working closely with world-renowned overclockers to push the Ryzen 7 2700X to the brink on the Crosshair VII Hero. Elmor has already set a new record for the AM4 reference clock, decimating the old mark of 151.56MHz with an incredible 240.61MHz. TheOverclocker has claimed records for peak Ryzen CPU frequency with 6GHz on not only a single core, but also all eight cores and 16 threads. Top scores have also fallen in key benchmarks for eight-core CPUs, with TheOverclocker setting the fastest time in GPU PI for CPU 1B, and Der8auer hitting the top of the Geekbench3 leaderboard. Precise voltage is vital when you’re on the edge, so the Hero tracks important rails from the best spot on the power plane, and it uses differential sensing to ensure accurate readings from both software and the onboard ProbeIT measurement points. Most motherboards rely on single-ended sensing tapped from a location that isn’t ideal, making it more difficult to gauge exactly how much voltage is being supplied to your components. With eight onboard headers for fans and pumps, the Hero has the cooling credentials to match its overclocking aspirations. It’s ready for custom liquid loops thanks to a high-amperage pump header that can push up to 3A, plus additional headers for monitoring coolant temperatures and flow rate. If you somehow run out of places to connect fans, the board works with the ASUS Fan Extension card, which supports even more fans and temperature probes. Taipei, Taiwan (11 April 2018) – G.SKILL International Enterprise Co., Ltd., the world’s leading manufacturer of extreme performance memory and gaming peripherals, is announcing the rules and benchmarks for the G.SKILL 5th Annual OC World Cup 2018 Live Qualifier. 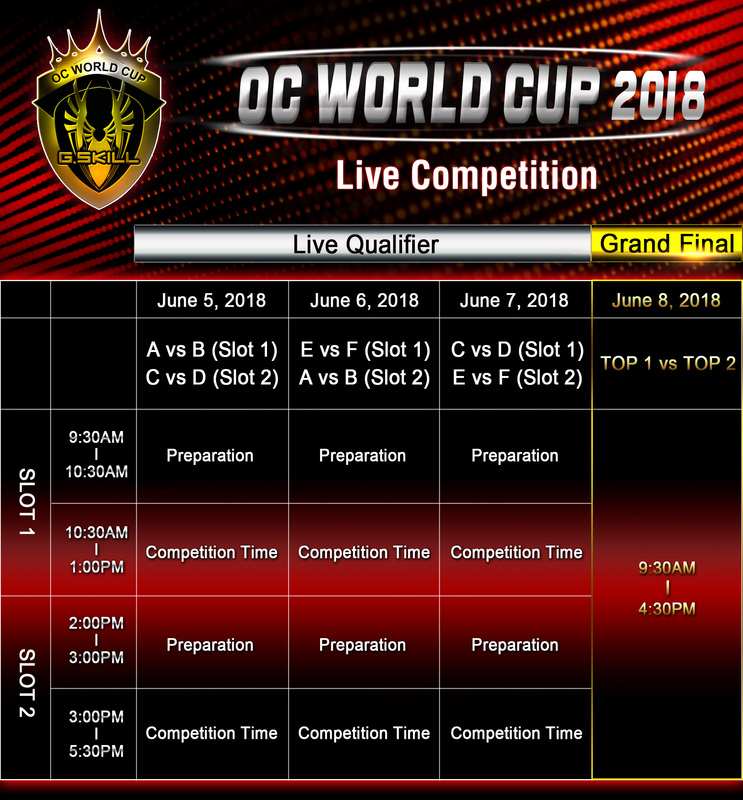 This live competition event will be held during the week of Computex 2018, from June 5th through June 7th, followed by the OC World Cup 2018 Grand Final on June 8, 2018. 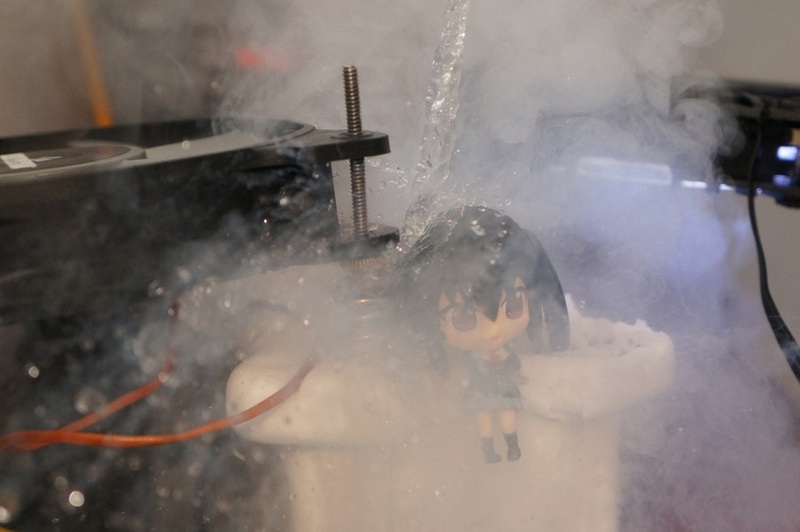 Be sure to check out the main stage at the G.SKILL booth for exciting live overclocking and liquid nitrogen in action! G.SKILL OC World Cup 2018 marks the 5th consecutive year of this major overclocking event, where the top 6 qualified overclockers from around the world compete live on stage at the G.SKILL booth during Computex. In the first three days of Computex 2018 (June 5th to June 7th), each Live Qualifier contestant will have two time slots to complete designated benchmarks for the highest scores. At the end of the Live Qualifier round, the top two scoring contestants would secure spots for a final battle in the Grand Final round on June 8th and a chance to win the $10,000 cash prize! For the contestant’s choice benchmarks, it must be a valid 2D benchmark listed on HWBOT with fixed CPU frequency and approved by the event judges. All OC World Cup 2018 contestants are restricted to using G.SKILL DDR4 memory, 8th Gen Intel® Core™ processor, and Z370 motherboards for the benchmarks. Taipei, Taiwan (28 March 2018) – G.SKILL International Enterprise Co., Ltd., the world’s leading manufacturer of extreme performance memory and gaming peripherals, is excited to announce the achievement of an unprecedented DDR4-5000MHz memory in dual-channels. This major breakthrough is the world’s first instance of two DDR4 RGB memory modules breaking the DDR4-5000MHz barrier on just air cooling, when considering that this world-record class speed was only achievable under extreme liquid nitrogen cooling just two years ago. This massive technological feat is achieved with the high performance Samsung DDR4 B-die ICs, and running on the MSI Z370I GAMING PRO CARBON AC motherboard and the Intel® Core™ i7-8700K processor. This in-development memory speed marks the first time in history that a pair of air-cooled RGB memory achieving the legendary speed of DDR4-5000MHz. While DDR4-5000MHz memory kits aren’t yet ready to hit retail stores, G.SKILL is taking major leaps in developing much faster memory speeds and demonstrating the brand’s unwavering dedication to continually push DDR4 memory performance into the absolute extremes. Shown in the screenshot below, on a system with the MSI Z370I GAMING PRO CARBON AC motherboard and an Intel i7-8700K processor, CPU-Z displays a DDR4-4700MHz Trident Z RGB dual-channel memory kit being overclocked 300MHz past its original rated speed to reach DDR4-5000MHz. 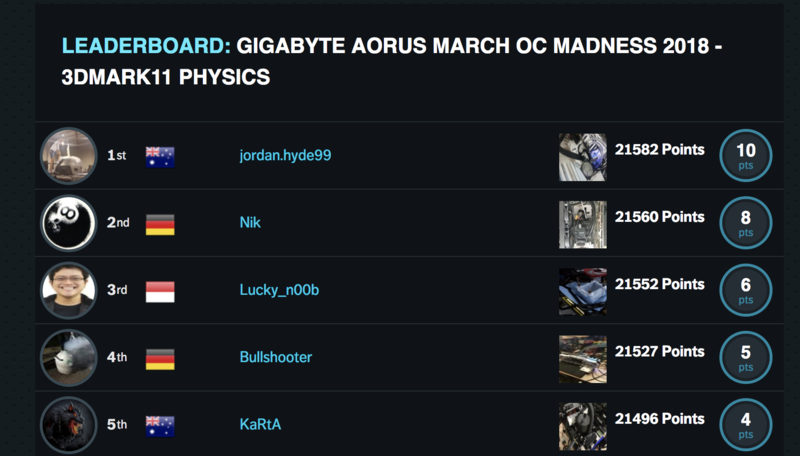 GIGABYTE March OC Madness: jordan.hyde99 leads with 5 days to go. 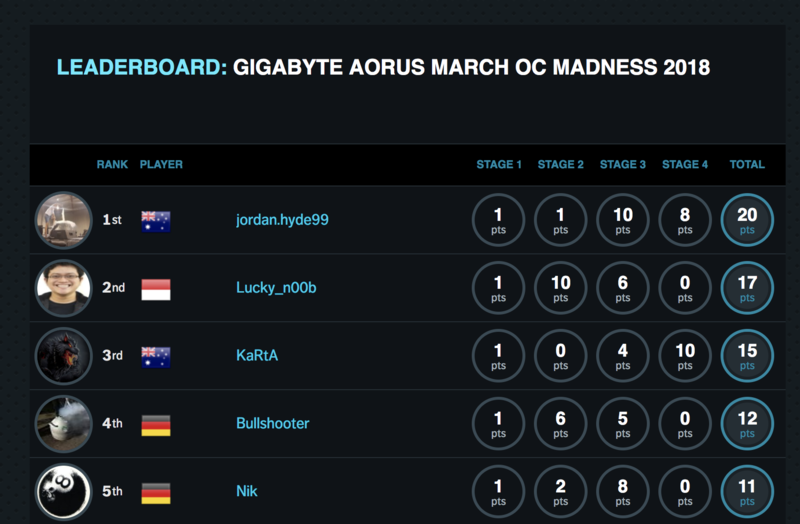 GIGABYTE kicked off their second competition of the 2018 OC Season here on OC-ESPORTS in March with the GIGABYTE AORUS MARCH OC MADNESS 2018 contest. With a little less than 5 days left, it’s time take a quick look at the current leaders, the CPUs and boards being used, the scoring and of course the great prizes up for grabs. 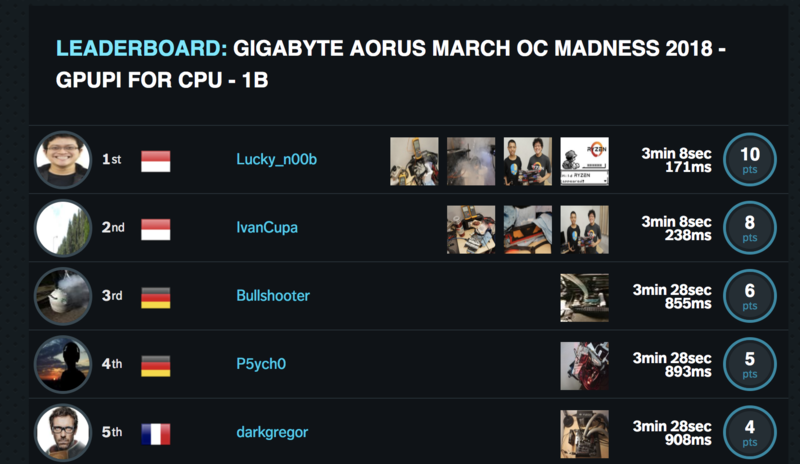 Running throughout the month of March 2018, the contest allows overclockers to use any Intel processor with 6 or less physical cores (disabled cores not allowed). However, to create a more level playing field, processors cannot use CPU core or cache frequencies above 5GHz. Contestants must use a GIGABYTE / AORUS motherboard and submit using the contest wallpaper to ensure only fresh submissions count. The contest spans three separate stages each starting and ending on a different date to keep interest levels peaked throughout. Let’s take a look at the stages to get a snapshot of who looks in the frame for some great hardware prizes from GIGABYTE. In Stage 1 we find Nik (Germany) at the top of the table with a leading XTU score of 2,822 marks. He used a hexa-core Coffee Lake Intel Core i7 8700K running at 5Ghz, a GIGABYTE Z370N WIFI and Corsair DDR4 memory. Here’s a shot of the rig used by Nik. Stage 2 bring us to another challenge, this time involving the GPUPI for CPU - 1B benchmark. At the top of the table we have Lucky_n00b (Indonesia) with a score of 3min 8sec 171ms. He achieved this with a GIGABYTE AB350N-GAMING WIFI motherboard, 2048MB DDR4 SDRAM @ 2661MHZ and a RYZEN 5 1600 @ 4989MHZ (+55.92%). Here’s a shot of the rig used by Lucky_N00b. 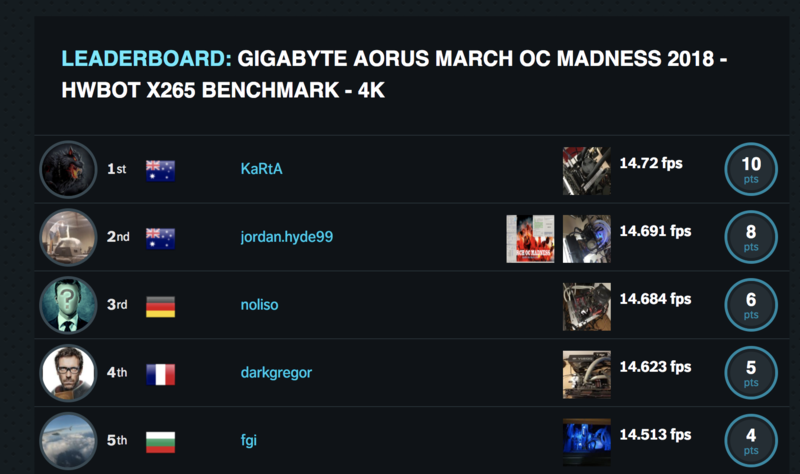 jordan.hyde99 leads with 21582 points, using a GIGABYTE Z370N WIFI with a 8700K. KaRtA is currently in the lead, with 14.72fps. 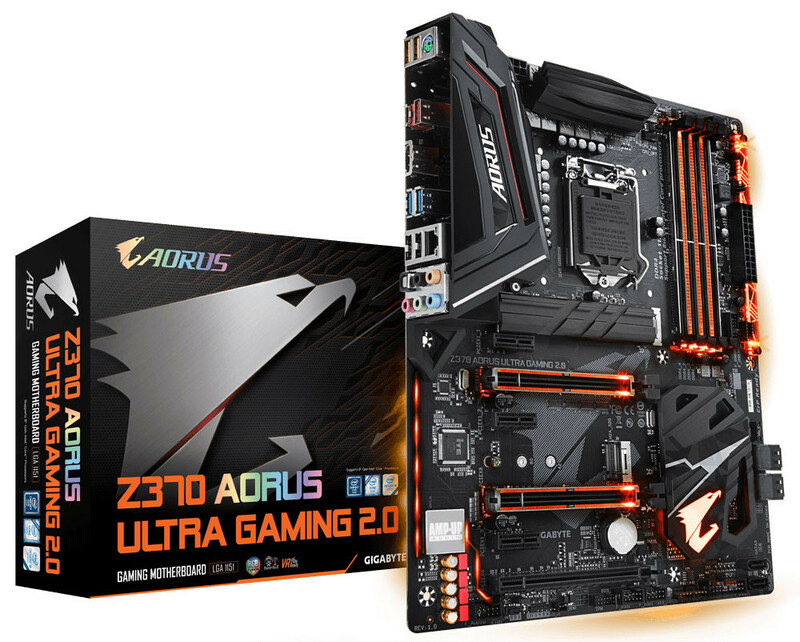 GIGABYTE released a major revision of Aorus Z370 Ultra Gaming motherboard. Revision 2.0 replaces the 7-phase CPU VRM of the original with a new 11-phase setup that uses stronger ferrite-core chokes that don't whine when stressed. 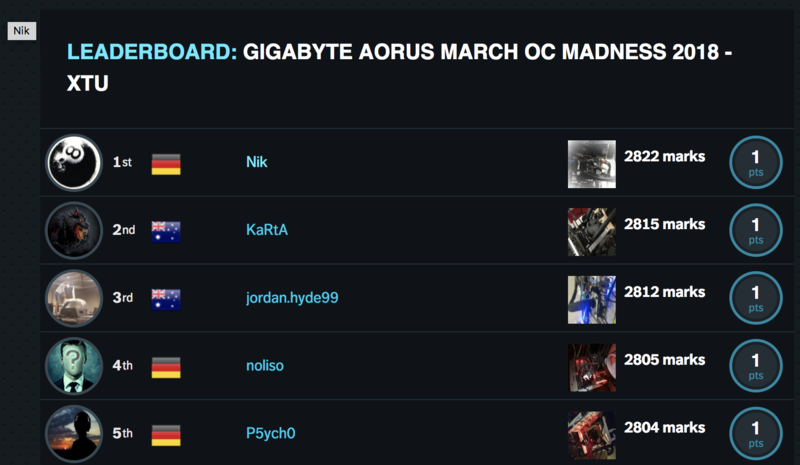 This new revision will be a part of the prize money of the GIGABYTE HWBOT competitions this winter: the AUROS Winter OC Challenge, the currently running AORUS March Madness and the soon to be anounced april competition too! The company is also including one M.2 SSD heatsink for the upper M.2-22110 slot, which the original lacks. Besides these, the Aorus Z370 Ultra Gaming 2.0 is identical to the original, including its RGB LED diffusers, multiple RGB headers governed by GIGABYTE RGB Fusion software, two reinforced PCI-Express 3.0 x16 slots (x8/x8 when both are populated) with NVIDIA SLI support, one gigabit Ethernet interface driven by an Intel i219-V controller, and a premium onboard audio solution with a headphones amplifier and 120 dBA SNR CODEC (Realtek ALC1220); and a price ranging between $150-$170. We will be migrating the forums to invision power board today. As all content will be migrated too, we expect this progress to take a whole day. Commenting on submissions and news will not be possible as it is integrated with the forum. Edit: come say hi in our new forums!